A group of girls wait for the start of a vigil at the intersection of Murray and Forbes Avenues in the Squirrel Hill section of Pittsburgh, not far from where 11 people were shot to death at Tree of Life synagogue. PITTSBURGH — They came by the hundreds, gathered together on a street corner on the main drag of Squirrel Hill. Across the street was the Squirrel Hill News Stand and the Squirrel Hill Cafe. The Squirrel Hill Flower Shop was just down the street, a few paces from the Squirrel Hill library branch. Alex Averin, 28, had worked at businesses up and down this part of town for years because he, like so many others who grew up here, could never quite find a reason to leave. As local lore has it, you can live three decades in this section of Pittsburgh's East End — a handsome neighborhood, largely residential, with a sizable and proud Jewish community — and still be considered a newcomer. 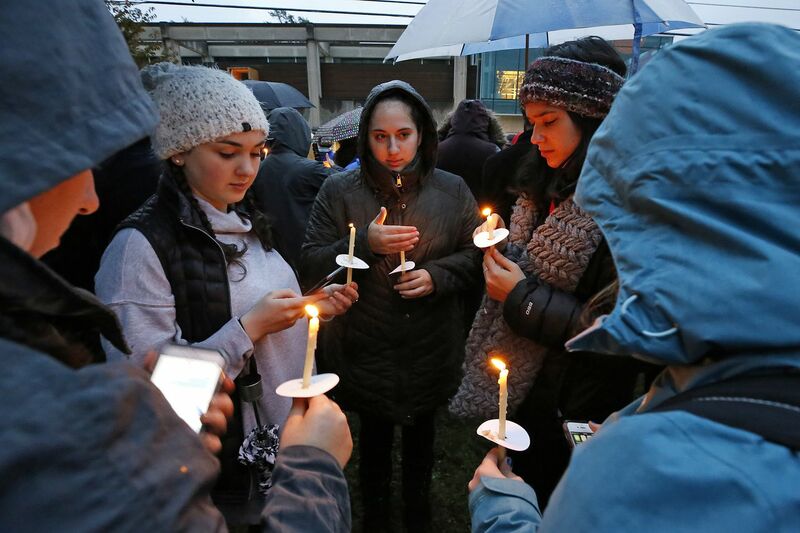 So as the crowd swelled at the corner of Forbes and Murray Avenues on Saturday night, Averin, taking a quick break from his duties as a cook at the Squirrel Hill Cafe, somberly understood that his neighborhood might now be associated with something else — tragedy. "I probably know the names of half the people" in this community, he said. "This is one of the last neighborhoods I'd expect this to happen." This was the shooting rampage inside Tree of Life Congregation, about a half-mile from the bar where Averin works. Police said Robert Bowers, 46, killed 11 people and injured six others when he burst into the synagogue and opened fire, yelling anti-Semitic language as he shot. He was later arrested and faces federal charges. At Saturday night's vigil in Squirrel Hill, just outside Sixth Presbyterian Church, the massive crowd — which occupied more than a city block — included John Fetterman, Democratic candidate for lieutenant governor. Gov. Wolf was also in town Saturday. But the vast majority of those gathered as the sun went down were residents — of Squirrel Hill, or other parts of the East End, or suburban Pittsburgh. Some wanted to show support or mourn. Many wanted to demonstrate the strength of their community after such unimaginable violence. "Nobody deserved this," said Renee Shissler, 49, who attended with her 12-year-old daughter, Ella. "People should not have to live in fear." Aaron Regal, 27, said he lived nearby and knew people who were members of Tree of Life. By nightfall, he said he wasn't sure if anyone he knew had been hurt. Or worse. He, like others, expressed anger that Bowers could have a gun, and said he thought it was time to "rewrite the Second Amendment." Regal's friend Ethan Frier, 27, said: "I wish I was surprised" by the shooting. "Another day in America." Yael Schenker, 45, said she knew someone who had been hurt but was hoping for the best. She said many people in the city would likely feel, firsthand, the impact of the crime. "Pittsburgh is a small town," she said, "and Squirrel Hill is a tight-knit neighborhood." The vigil, organized by students, largely avoided direct discussion of the charged issue of gun control — though there was a notable exception. As the speakers' remarks wound to a close, the crowd began to chant: "Vote. Vote. Vote." Then, to punctuate the proceedings, a man yelled out from the crowd. "We," he said, "are still Squirrel Hill."